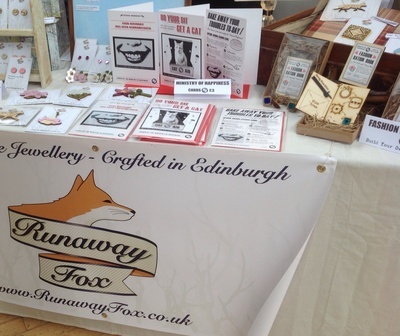 I spotted Runaway Fox's stall at a local craft fair, and I immediately fell in love with their unique jewellery. 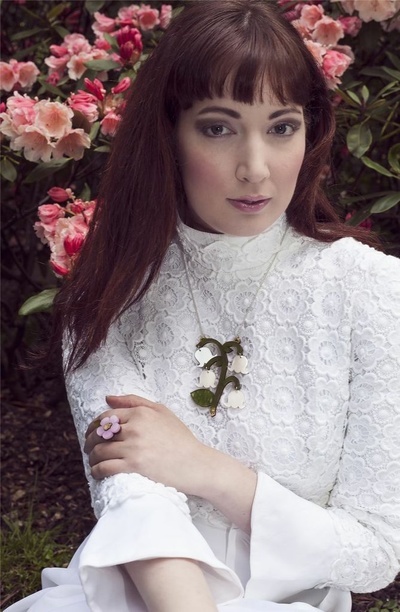 [LINK www.runawayfox.co.uk) Runaway Fox is a partnership of designers based in Edinburgh, Scotland- Poppy and Luis. 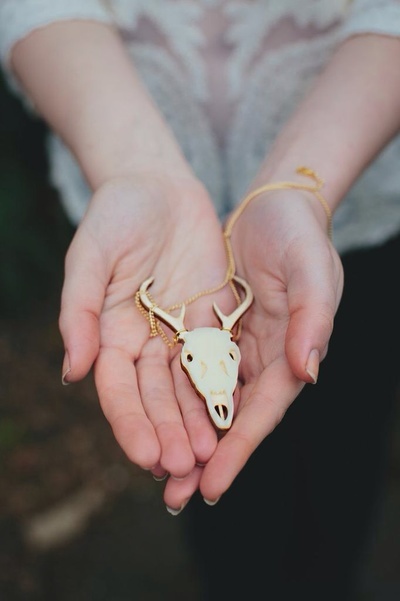 They are artists with a fascination for the curious, the strange and the wild- best known for wooden and acrylic jewellery, particularly the Animal Friendly Taxidermy collection. However, not ones to stand still, they are already breaking away from the laser cut jewellery scene, moving into design (for notebooks, bags and cards), making creative DIY kits and most excitingly casting and sculpture. I caught up with them after the event to ask them a few questions about their business. How did you turn your ideas into a business? How did you get started? It might be a slight exaggeration to say there was a Eureka moment that suddenly propelled us into designing, but there was certainly an element of sudden inspiration that got started. Designing and creating is something that we’ve always pursued in various ways, be it interior design, musical comedy or painting and sketching. 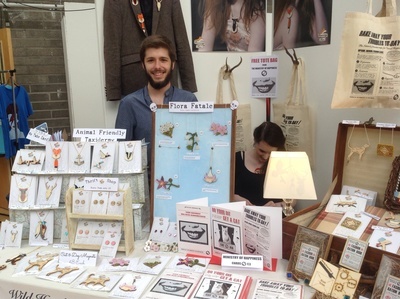 I suppose the thing that got us going really, was working out a practical way to turn our hobbies into a business, so the best route at the time was to begin with laser cut jewellery. Inspiration comes from unlikely places. Often it’s a case of taking two things we're interested in and combining them in a novel way. We’ve been developing a new range recently where most of our inspiration has come from the butcher and fishmonger down the road. We ended up finding more than just inspiration though- we’ve been busy replicating real pig snouts and ears, chicken feet and crab claws. What's your favourite piece in your shop at the moment? Whilst we’ve always had a soft spot for our Animal Friendly Taxidermy collection, our new work is looking really exciting. 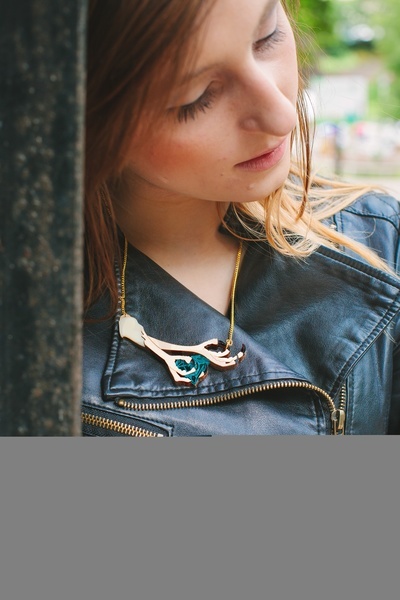 We’re both big fans of the crab claw necklace- not laser cut acrylic, but a real life crab claw cast and replicated in resin. We’ve hand painted the entire thing and it even comes with water droplet effects on the pincers. What piece of advice would you give to someone else starting their own business? Don't be afraid to make mistakes, they will happen and you will learn a lot from them! If you're determined and prepared to work all hours to begin with, you'll be fine. It’s not always the most straightforward thing to do, but if you’ve got an idea, run with it. You will meet new people, learn a million new skills, and even if things don’t go to plan, you can only benefit from trying. We’re just seven months in and things are going better than we ever expected. We’re currently producing a macabre range of jewellery for a top-secret partner down south. We can’t reveal any more just now, but it’s totally wild, weird and unlike anything we’ve made before. In the last fortnight we’ve been elbow deep in animal parts too many times to mention, but it’s been totally worth it.